After yesterday’s game, the Reds need a win today in the worst sort of way. Mike Leake, please continue the fine pitching the Reds have had of late.Ã‚Â Offense, please wake up and hit the ball please!!! BHam stole his 2nd base of the game on a pitchout with the catcher fumbling the ball while trying to rush his throw. BHam is 2-3 tonight with a 2B, a run scored and an RBI. He could start making believers of a lot of people if he keeps up his improved plate performance. Big Brox is starts a rehab with the Bats tomorrow. Ludwick hit .167/.414/.167 in 0 PA during his rehab assignment with the Dragons and is 0-5 in 5 PA so far with the Bats as he continues his rehab assignment at AAA. Ludwick has a ways to go before he is ready to hit against major league pitching and he has 15 games left in his rehab to get it done. It’s funny going on MLBTR and seeing an article stating the Reds are interested in Hunter Pence. Immediately, you have a ton of their fans saying that they’d get Cingrani in a trade, with a lone Giants fan being realistic and saying there’s no way they’d get him. Then, they switched their focus to Robert Stephenson, with the logic being, “We traded away Zack Wheeler, this makes it an even trade!” Again, the lone smart fan says that that’s an insane price for a rental. Just thought it was funny how much fans overvalue their own players. @rhayex: That’s some funny stuff. A starting pitcher who is rocking a sub-3.00 ERA or a pitching prospect who has the makings of a triple digit fastball ace for a rental of Hunter “Seizure” Pence. I’d give them Robinson, Villareal, and a Sandwich TBNL. Keep in mind Pence is making $13.8m this season. So not only would he be a rental, but the remainder of his salary this year would be like ~$4.8m for the remaining 56 games. @ToddAlmighty: I would never make either of those trades, myself. It’d be like someone trading their top prospect for Brandon Phillips, only not at a key defensive position. Exactly…Giants fans are clueless as to how much talent it would take to acquire Cingrani or Stehpenson. And Stephenson would easily be the more expensive of the 2. I’m talking more than the Reds gave up to get Latos!!! @L.A.Red: Whoa, let’s calm down there. That’s a bit of a ridiculous statement for a guy who hasn’t pitched above A-ball. Seriously, when he comes up and posts a sub 3 ERA with good peripherals, THEN he’ll be worth more than Latos was. Not before. Tonight’s lineup is, well, it’s really something. @CP: Yes….something. This set of guys makes me lobby for Cozart to hit in the two hole. @CP: Being awful kind with that wording. Everyone knows it’s another game that Dusty isn’t too interested in winning. People can say anything they want otherwise, but you’ll never be able to convince me that a manager actually wants to win when they bat someone of Izturis’ level 2nd in the lineup. @ToddAlmighty: Agreed. “Want to win” and “Izturis batting 2nd” don’t go together in the same sentence. Here’s the article, if you need some laughs. @rhayex: I just made a post on there for the first time, similar to my previous post here. I’m interested if there are any Giants fans who like or hate it. Ludwick is 1-3. RBI groundout after Hamilton stole 3rd. Hit was a double. 5-1 Pirates over the Cardinals. That five-game series, coming off getting swept in Atlanta, could really pound the Cardinals just as they head into GABP for three games. Big opportunity for the Reds. Sean Casey’s makeup looks terrible. He’s orange. 9-1 Pirates cranking the Cardinals right now. Pour it on. @Steve Mancuso: Man, I don’t like the Cardinals. If they give up anything of value for pence its a complete failure on the front office. Instead of looking for outfielders, how about a shortstop? I mean while in San Diego, they could do a deal for Everth Cabrera (279/356/375; wRC+ 110). We’d lose something in the field but pick up some much needed OBP and a 2.6 WAR. This move has the added bonus of listening to Grande say “Everth”. @joelie1274: Everth is about to be on the PED suspension list this week. @Steve Mancuso: Ah, thanks. The part of the game I don’t pay any attention to. @joelie1274: Sure. I just think the Reds would be extremely hesistant to spend the prospects necessary to grab a relatively expensive SS when they already have Cozart for peanuts. That said, you make a good point that the Reds don’t have to upgrade LF to improve. Arguably also C, though that would be weird because assuming Hanigan comes back, they’d be keeping a guy that has been simply outplayed by someone esle. That’s a lot of flexibility. @Hunt4RedsOctober: exactly equal to the odds there is a 1,2, or 3 run lead for the Reds and it occurs in the 9th. I’m depressed after watching Vin Scully all weekend, it’s back to THumb. Leading off – O for Robinson. Batting second – O for Izturis. That was one terrible at bat by Ceasar. There’s that Votto guy again, someone needs to think about signing him long term. Would have been nice to get that double with someone on but when you don’t have anyone who can get on base in front of Votto, well, that’s what you get. Would Votto have doubled of there was a man on?? I already miss GG. Go Reds! I love that Frazier knows how to take a walk, it raises his value so much even when his hitting hasn’t been the best. Wow. that was a ball to Frazier. Inconsistent zone tonight. Do we get effort points for loading the bases in the first? Still a good start though, we made him throw a lot of pitches after the first two batters. @Mwv: This is a case where raising his pitch count doesn’t really matter though. The Reds will be hard pressed to find a better guy to hit off of than O’Sullivan. Especially if that inning was any indication. He wanted to walk XP but XP wasn’t having none of that. Go Reds! How are you not taking all the way? A good manager wouldn’t let Paul take the field. One half inning and I’m already sick of Marty tonight. Lineup construction failure contributes to not scoring runs. XP batting first, Todd Frazier batting second. Votto’s double might bring in two runs. The Reds get three runners on base without scoring. @Steve Mancuso: Story of the season. Well, that might as well be a double. The Reds haven’t thrown out a runner in a month. Does Paul have options? When Ludwick gets back won’t Reds be short LH bats if Paul is optioned? I’m thinking Paul stays if trade doesn’t happen. I’m suprised Headley’s numbers are that low. I’ve always remembered him being productive. Mike’s going to have to pitch a shut-off to have a chance at a W.
Understand Choo is hurt, but maybe not a good idea then to make tonight the night you give BP a night off. @abox03: Lot of season left. No need to play with a sense of urgency at this point. Does anyone wonder what could have been if Yonder Alonzo had stayed? @Larry1980: I don’t think Yonder has shown that much. His numbers last year were not particularly good for a first baseman. I know Petco hurts his power but 9 HRs is very low. He is still young enough to improve but he reminds me of Sean Casey at this point (not as good as Casey at this point). His HRs a little above last year’s pace but he has stopped hitting doubles. Good job by Leake getting out of trouble. Wonder why Baker went through will giving Phillips the night off knowing that Choo wasn’t playing tonight. This umpire has no clue what he’s doing. @crimedogg24: We ought to just post the “umpires stink” comments at the top of the thread and be done with it. What will the Reds do at CF next yr given that Choo is unlikely to resign? Reds now with 2 runs in 31 innings. Marty is a little lost right now. “he takes it to first, inning over”. What? Leake is a ball player. Great hustle. Wow, what a play. He was out. I like the fact that mlb.com t.v. is showing the fox-track more often then usual. Leake should be batting second. Robinson got a hit but looked absolutely terrible in that at-bat. Broken bat single. Well, this inning is over. At least they got a couple of hits. Man I can’t believe izturis didn’t come through there! what a shock! I guess the strategy of having the worst hitter on the team bat second didn’t work out. Votto leads off next inning! @Steve Mancuso: Coincidence I’m sure. Would you rather have a game like yesterday when no one could get on base and no runs were scored, or one like we have so far where 5 are left on in two innings and no one scores? I guess both warrant an appearance by our favorite brace-face goat. ..andd Leake gives up a hit to a .200 hitter. Nice! Mark kotsay has mate a nice living. This is a big boy ballpark! Mark Sheldon saying on the radio right now that Ryan Hanigan had a setback with his injury and doesn’t know when he’ll be back. 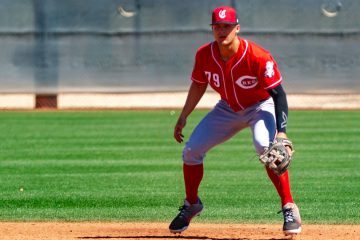 @Steve Mancuso: Maybe the Reds could trade for a backup catcher. @Hunt4RedsOctober: I would definitely say it’s a big “need” now if Hannigan is out for an extended period of time. Meso is fine if he’s hitting, but if he goes cold we could be in a big hurt with a cold Meso and Corky. I don’t know if much is available at the position, though. That guy has got to go. Leake throwing a lot of pitches. You know what is sad and pathetic? A twitter account with 5,100+ tweets, and only 42 followers. Also, I’m sending a screenshot of your posts do that website you write for. Have fun! The Blog is almost unreadable now. We all get upset and frustrated but come on. Leake is starting to make a habit of pitching out of tough situations. Mike leake is an interesting guy to watch. Up, down, in, out. Always changing speeds. Did I just hear the PA guy announce Brandon Phillips? Maybe we can get a do-over of Izzy’s at bats. This Sullivan guy looks pretty good (eye roll). Can’t buy a run right now. Wow. Bruce just missed that. The ball was on top of the right field wall. @Steve Mancuso: bad luck all around. It’s gotta change soon. Dang. There was our run. Are thes posts going the wrong direction now? Petco saveth, Petco killeth. Wow, this team can’t buy a run. Wow, what a 3rd inning with the heart the order against a bad pitcher. Man, are these guys frustrating. Speaking of trying to find silver linings in black holes, at least this guy appears to be a Big Lebowski fan. @Kyle: That is a huge silver lining. I know our overall offensive numbers for the year look pretty strong. But I think the real problem is having too many guys in our lineup who go 3-for-4 every night for a week and then go 0-for-4 every night for the next three. No in-between. The final stats wind up looking OK, but it really causes frustration and problems for a team trying to create consistency. Part of that I know is just the nature of the game, of course. Any ideas on what stats might indicate whether this is actually true of the Reds this year more so than other years or other teams? @caps: My take: Dusty will not stay with a lineup that appears to work. Reference games 1 & 2 of the Giant series. He has to manage because that is what he is paid for. Frustrating. @CharlotteNCRedsFan: He did manage to crush any hot streaks Frazier, Heisey or D-Rob seemed to be building. But it has to be more than that! Why do we have so many extremely streaky hitters? There’s gotta be something there with the approach? @caps: I dunno. Seems to me the problem is that only 2-3 guys get on base consistently (Choo, Votto, and 1/2 Bruce, 1/2 Todd). The rest pretty much rely on their batting average to get on base, and that is highly variable. @CP: I’d just like to see a stat that can measure a team’s offensive consistency; or that of a player. For instance, the overall average runs scored per game on this road trip will still likely paint the Reds offense fairly well. But we all know that isn’t quite the case. @caps: I think the only stat would do that would be team wOBA, since OBP is the stat most closely correlated with Runs Scored. I dunno. You look over at the Cards and their recent offensive struggles. I just don’t think there is such an offense that is actually “consistent” in the sense that we fans think there is. Seriously, this is ridiculous. At this point I almost want to see what everyone else is getting upset over. Also, I haven’t been following the game. Anything important happen? (Hoping someone will say Bruce GS). OK, I think I’ve got the mess cleaned up for now. Not much we can do when he keeps changing IP addresses. He’s obviously got mental issues. Even though it’s annoying, it’s also sad. @Steve Mancuso: Unfortunately. And still on the team. Where is that trade we need? @Steve Mancuso: Who is this guy? I’ve never seen him commenting on this site before, and I missed all of his posts. What happened? @Steve Mancuso: Izturis batting second, speaking of mental issues…..
Two runs wins the game tonight. Lets go Reds! Mike Leake all over the place. This could be the ballgame. Leake, get it done. Nicely done. Timeto get one of those things they call runs. You know, when someone runs around the bases and touches all of them? Maybe they forgot. Leake did a good job on Kotsay to get out of the jam. @CharlotteNCRedsFan: Definitely agree – byw, does anyone remember the SF series last week – great hitting. Dusty Baker managed that into a double play. Calls for the hit and run with a slow runner and a pull hitter. Predictable results. Great job, Skip. @Steve Mancuso: Isn’t it weird how he suddenly started calling for hit and runs? None at all the first 40% or so of the season then just before the break he started calling for several and it has continued since then. Woo! Way to take a walk, XP! That’shard to do, walk Cozart. That is 15 walks all year to Cozart. It’s just unbelievable that Baker would call for a hit and run in that circumstance, with that pitcher, that runner, that hitter. @Steve Mancuso: Don’t think you really mean “unbelievable”. Was completely believable. @Steve Mancuso: I think Dusty has a pair of dice in the dugout. He rolls them when ever the Reds get a runner on and makes his decisions based on said roll. unbelievable? Not sure if that is the most fitting in who we are talking about….It is almost comical how the optimism is just drained following these past few games. You almost dread getting a runner on with less than 2 outs because of the DP risk. In high school if a guy was this wild we were told not to swing until we had two strikes. It’s kinda amazing that with all these walks and hard hit balls it’s still a scoreless ballgame. 2 runs in 34 innings. 0 runs in 20 innings. @CharlotteNCRedsFan: Can you say Izturis? Bright side: Our pitching has only given up 9 runs in 41 innings for a 1.97 ERA w/ 4 games against a hot LA team. @abox03: Pitching has been good this entire road trip, phenomenal job. @abox03: Yep, the pitching will keep us in these games when the offense struggles. Leake has it going now. @abox03: Wow, I hadn’t realized. I knew our pitching had been good, but that’s ridiculous. If our offense could just heat up at the right time (October run! ), we could have a very dangerous team. If Leake can hold’em for another inning or two we’re gonna blow this o’sullivan up soon. @cincyreds14: just trying to stay positive bud. Hey, doesn’t George Culver post on RN? @CP: Definitely someone with that screen name does. @CP: Not tonight. Can’t be two places at the same time. Leake is picking it up. Leake is zeroed in now. It is truly remarkable that we have not been out of a single game on this road trip, save for maybe the second game of the double header when Dusty started a Triple A squad. The pitching has been excellent all season! What is truly depressing is that if we fall behind 2-0 it feels like we are out of the game! Alright, Robinson in with the triple…now it’s up to…..oh. Did Marty just say that triple was “the first run of the game” ? Man on 3rd 0 outs, gotta do some bidness now for sure. Two 22-plus inning scoreless streaks in less than six weeks; plus a weekend in April when we were 1-hit in back to back games? That simply is unacceptable for a team that claims to be in the fourth year of a championship window. Not sure how Robinson made it past that one, but cool. What does it mean when a Reds player crosses the plate without getting tagged out? Izturis gets the RBI to end the skid. Who bet on that? That is just sad. I just saw ESPN’s update. A groundout to score the first run? Man, Marty is struggling tonight – “Jay Bruce is the 2-out batter”. Say what you will about Marty but sloppy he ain’t. wow, what a big outfield. I like Bruce at clean up. @Zabka84: Me too, good point. Lucky break for Bruce – makes up for the last ball he hit to the top of the fence. Jeez – come on Todd. What are you doing!! Todd Frazier seems to have no pitch recognition. Swinging at the first pitch is killing the Reds, just killin’ em. @Sergeant2: Woold or will be inexcusable, even for this lineup. @redskaph: Oops. Sorry, that reply was meant for CharlotteNCRedsfan, typo and all. If they only get 1 this inning, I think I’ll cry. Anyone else think Votto is trying to hit a homer? Three flyballs right of center tonight in the air on big swings. Pretty uncharacteristic. So far in the 5th, we have had 5 walks, 4 hits, and 1 run. That’s hard to script out. If I have to listen to Thom say one more things about the buckeyes, I’m going to commit myself. Put the lotion away Thom. Chris Welsh may have just shushed him with that Florida comment while discussing DRob. @BearcatNation: He DID bring up Kirk Herbstreit without mentioning OSU, though! @prjeter: True. That was surprising. And don’t get me wrong. I like OSU. But this is baseball. There is a time and place and the redlegs have some going to accomplish. @BearcatNation: Thom knows even less about football than he does baseball. But his homerism for OSU knows no bounds. Good patient at bat by XP. So that idiot is banned now. Now, if the Reds can just put about four runs across in this inning, I’ll be happy. @Chad Dotson: Nice work, boss. Honest to God we need a new hitting coach. @redskaph: Think he means Eric Davis. @CharlotteNCRedsFan: The Reds have a hitting coach? Hey Fraz, first pitch hitting again I see – why is there such a consensus on this board that these Reds are a totally undisciplined hitting team – and Dusty continues to do absolutely nothing about it? And this SD pitcher is absolutely horrible – and the Reds are lucky to get 1 run off him in 4 innings. @cincyreds14: Honestly, it’s a mob mentality. If the person in charge–in this case, Dusty–claims that you aren’t swinging enough, the players will believe it too (especially when he’s the one filling out the lineup sheet). On the other hand, while I agree with you about the Reds lack of discipline, I don’t think I would’ve watched enough baseball this year to have caught it without you guys. I knew it was an issue last year, but coming into this season, I believed that they might very well have improved. They didn’t. @rhayex: Very disappointing – Hunter Pence anyone? I said it earlier, but I exercise my pastoral right to repeat myself: 5 innings; 5 walks; 4 hits; 1 run. Really? @preach: Fraid so. ‘Nother big sigh. These guys are just awful with RISP. And it does matter. @homerandbruce: The Reds are hitting .251 overall and .252 with RISP. They are hitting .319 with bases loaded. @Steve Mancuso: I know and I think the are second in the NL in runs scored. Just doesn’t translate well when watching them play every night. Maybe they are really good scoring runs. Okay Mike, make that run stand up. @CharlotteNCRedsFan: Might well have to. Oh well, 1 run more than Sunday. Frazier looks like he needs a break. I’m feeling more and more confident about Bruce being a great player lately. @Boneill1621: A. Yep. B. Yep. C. On a ground ball, but we’ll take it. @Boneill1621: Crazy thing is that if Alonso was a bit more spatially aware, he could have tapped first base with his foot while taking the same set-up to throw and almost got Robinson. A few inches on both regards from being a 3-2 double play! Game of inches! @Boneill1621: @Boneill1621: That would be great if Izturis gets the game winning RBI – since that would mean a 1-0 Reds win. And yes, the Cincy Enquirer was right on top of it back in May right after Bruce had 1 HR and a handful RBIs in April (they seemed to forget that Bruce had just turned 26 in April – and that Joe Morgan had his best years at 31-32 – how quickly they forget). Nice throw Mes. Out by a mile. Mes with an absolute laser throw to second base. Really nice throw from Mes. Cowboy says, “his best ever”. I think I agree. Good job by Izzy there. Mes and Izzy bailing out Mike and Cozy. Bad call by the umpire bails out lousy defense by Izturis. Leake and the bullpen may have to make this one run stand up and they just might do that. Mes showing some arm of late, thank God. … Cozary, on the other hand, could at least chip in with some decent defense if he’s going to continue sucking at the dish. @caps: Dusty is also an idiot. @rhayex: Yep. Although, I can’t fault him. Ninety-five percent of the American population also struggles with basic math and logic. He’s just an “average” American. I REALLY want to know what his answer would be if someone asked him how many RBIs Phillips would have if all three players in front of him had .000 OBP. The answer is (10?) the amount of homers he hit. His inability to realize that players getting on base and scoring runs are correlated is the height of lunacy. @prjeter: Dusty is definitely not an average American – wish it were true – that way everyone could live on a palatial estate in wine Country in CA and drive new cars every year. @cincyreds14: I don’t recall mentioning income; just grasp of mathematics and logic. @caps: Baker will forever hold firm to his obsolete concepts. He rejects new thinking about the sport out of hand. The Reds who have been successful at the plate either ignore him and do the opposite (Choo and Votto) or have enough talent to overcome it (Bruce). Otherwise, it’s just a trail of underperforming hitters, not improving, giving away at bat after at bat. @Steve Mancuso: That is very well-said. Frustrating, but a fair summary of where we’re at. Anyone else notice, that with Leake’s newfound pitching prowess, his hitting has dropped off a cliff? @rhayex: Didn’t he have 3 hits in his last start? @rhayex: I’ll take that trade off any day. @Sergeant2: I know, right? That’s exactly what I meant with my observation. Grateful for the run. But just one off this guy is truly abysmal. this team has no margin for error with this offense. This as bad of a performance as yesterday frankly. The Reds will not face a worse starting pitcher than O’ Sullivan. Career 6.04 era and 1.57 WHIP coming into tonight. This year- in only a few appearances- is 4.73 and 1.88 (BAA is .333). This is a game the Reds can’t afford to lose. That phrase seems like a broken record lately. @Kyle: They’ve been hitting and walking tonight. Just been kind of unlucky with sequencing. Still, you’re right that they should have done much better against this guy. Thankfully Mike Leake so far has been nearly perfect. I for one, (probably a minority) would like to see the NL go to a DH. I know that makes it hard for small market clubs to add an extra payroll spot, but I think it makes the game more exciting. Just my opinion, pitchers should not hit. @abox03: With this lineup, there is no way I would DH for Leake. @abox03: Same roster size in AL and NL. A “bench player” becomes the DH. Since there are no double switches and pinch hitting for pitchers, turns out the bench feels much deeper, I’d bet. Leake cruising now. I’d send him out for the 7th. @Hunt4RedsOctober: So would I. I wouldn’t blame Dusty for taking him out, although I’d hesitate based on using all–ALL– ALLLLLLL of our bullpen last night. All of it. There was not a single pitcher left in that ‘pen. Bruce was going to have to pitch the next inning. I was worried about leake going in to this inning being over 90 pitches but so far so good. I’m sorry for missing it – but where’s BP? @cincyreds14: Scheduled healthy night off. @Steve Mancuso: Thanks Steve, appreciate it. @seadog: Ever wondered if the Reds have any good coaches? If so, please allow me to pitching coach Brian Price. Now Jacoby? The question is whether the Red’s young hitters are actually listening to him. If NOT go get Ed, please. Izturis swings at the first pitch. Easy out. Sigh. Trade Hamilton for Pence…Walt sign off on this please..
Joey is slow like a glacier. Terrible base running decision by Votto. JV – what was that? @cincyreds14: Another game, another needless out on the bases. I can’t stand it. I love it when managers bring in LHP to face Bruce. Do they not look at basic splits? 😥 baserunners aren’t important, right? Actually, not the worst decision in the world, but still. So many times watching the Reds run the bases is a hoot. @Sergeant2: Somehow, I’m not in a hooting mood these days. @redskaph: Gotta laugh to keep from crying. Bruce continues his season of hitting well off lefties. Can we put Thom in the sandbox. Pretty please? I gotta tip my cap to all you EST Reds fans staying up to watch the game. True Blue fans for sure. Go Reds! Todd is lost again. That didn’t take long. Horrible AB, just horrible. Forget about an outfielder. WJ needs to be looking for a 3B. Todd Frasier can’t even hit an 87 mph fastball. Shoudda hit Hannahan for Frazier, who’s solidly back in a major funk. Do these hitters know it is their prerogative to work the opposing pitcher for the pitch you want to see – and that they really do not need to swing at every pitch the pitcher throws and that includes those the pitcher actually wants them to swing at. Work the opposing pitcher a little better, Reds hitters. One run tonight, so sad. @cincyreds14: I wonder if they know. It is their manager’s prerogative to have them swing at every pitch that leaves the pitcher’s hand in a general direction towards home plate, unfortunately. Leake is fired up out there. Has some joker told Frazier that walks have been outlawed. Well, its not funny. Not to keep harping on this hitting approach thing, but I’m just not convinced that a trade really works for this team simply because I’m not totally sure talent is the problem. We’ve seen Frazier (to a greater degree) and Cozart (to a lesser degree) and now Mesoraco (to a middling degree) show signs of being quality, starting-caliber hitters. But when they go bad, they go so bad!! Why isn’t someone there in their ear, showing them video of how to get right sooner. Everyone is gonna have cold spells, but I gotta believe better hitting instruction would limit our young guys’ slumps better than this. And a trade for Hunter Pence, Alex Rios or anyone else isn’t gonna fix that. @caps: A trade is the only hope. Just like Choo for Stubbs. Choo is an established enough hitter that he basically ignores Baker’s nonsense. The problem is all the hitters coming up through Dusty’s minor league system. Now, Jocketty needs to trade for the right person. Choo was the right person. Willy Taveras, Orlando Cabrera etc were the wrong people because they had no plate discipline. That’s why it’s called Dust-proofing the lineup. @caps: I guess what you are saying is its the hitting coach (rise, drain, repeat – been saying and have heard it for a few years now). Often watch other games and don’t see the anemic, undisciplined hitting the Reds consistently demonstrate. That is why the Reds lose 1-0 to poor LHP (a win yesterday would have been huge – all I heard on the radio today was that the Dodgers have a 26-6 record in last 32 games. Reds MVP = Mike Leake (btw, where did Mike buy that t-shirt he has on tonight). @cincyreds14: Mike Leake is the Reds most dependable starter. Period. Do any of you think That maybe the best trade the Red’s have made lately…was Latos for Vazquez/Granadal/Alonzo?? Just a great trade by Walt..He knew something?? Amazing game for Leake. Time for the bullpen to bring it home. Leake has been amazing..not only tonight, but all year long.The kid is a pitcher…. I am a bit nervous with all the 2nd guessers thinking Chapman should have been put in yesterday. He is a bit rusty and the Reds need a solid outing. If ML doesn’t get at win toight I’ll be majorly unhappy. LET’S GET SOME RUNS!!! (or at least 1 more). Hoover in the 8th, Chapman in the 9th. @Steve Mancuso: Chapman, with his lack of usage lately, should be interesting. Another amazing start by Leake. It’s hard to pinpoint what’s different about him this year–this game could’ve imploded at several points tonight. Seems that’s he just maturing and learning how to pitch around trouble by trusting his stuff; no doubt Bronson has something to do with it. Regardless, his performance at least makes me feel justified in continuing to watch the game even though the lackluster offense remains frustrating. @seadog: They said a couple years ago that he could be another Greg Maddox so don’t bet against it. Another textbook AB there. Wow. Chris’ nickname ought to be 0-2. First pitch swing= easy out. Mind boggling. The Reds still have the lowest batting average in all MLB swinging at the first pitch (.308). The Cardinals, by comparison, are batting .378 swinging at the first pitch. That’s from being more selective. I didn’t mind Mesoraco’s swing there. The pitch was right down the middle, he just hit it off the end of the bat. It’s the balls in the dirt or out of the zone that are mind boggling. How old is Mike Leake? People forget that Leake went straight from college to the majors. The way he has progressed is impressive. I’d love to see Dusty play with some new lineups to help break this slump… BP second tomorrow night with Mes batting cleanup? They’d each see some different pitches than they normally do… could do wonders! I know it’s crazy batting one of your hottest hitters higher in the order and placing a struggling all-star in between your two best hitters to help jumpstart him for the stretch run. Just crazy. Cozzy has a little Steve Sax in him. @CharlotteNCRedsFan: that’s a comforting thought. Hoover has gone 15 appearances without giving up a run. Hoover making it look easy. 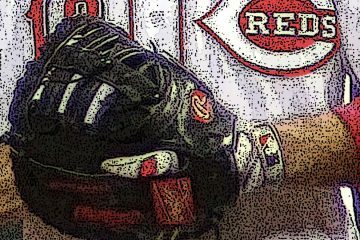 Cozart – please wake up, your MLB career is hanging in the balance – as you continue to show very little this year. That was a great inning. Bullpen has been dominant since that little mini-June swoon. Cozart was trying to get revenge on Joey. It’s amazing how utterly out of it Marty is. He just went on and on with great emphasis about how important it was that the Tigers traded for Jose Veras today. Marty says everyone knows how badly the Tigers needed a closer and Veras will be great for that. Problem is that the Tigers got Veras to set up. They’re plenty satisfied with Benoit in the ninth. @Steve Mancuso: Not the Famer’s best night. Looks like Chapman likes tossing the ball! Not sitting on the pine. @seadog: Yet another reason he should have been used yesterday. But the idiotstick yawns at stuff like that. 24,050 turned out for tonight’s titanic struggle, 24,050. Hey Sarge – no Ask Marty tonight? What’s up with that? Curious to know if he like cats or dogs better. Love my Marty though. @CharlotteNCRedsFan: Oh there was definitely an “Ask Marty” bit tonight, but I used the time for a refill break. I love Marty too, although he does annoy me at times. Go Reds! @Sergeant2: Sure but that’s Marty. Wouldn’t want him to change by even a little bit. Must have been emptying the dishwasher when the segment came on. Hate I missed it. See you tomorrow Sarge. Not that any Reds are hitting, but…Hanahan followed by Robinson followed by Izturis. Who’s this number 54 coming into the game? Very happy we don’t have to witness anymore Reds’ ABs tonight. Come on Chappy – close it out. Wow, Izturis’ wRC+ is 27. That isn’t good. Izturis’ slash line after tonight’s 0-for-5. Looks like one of those lines from my Aroldis Chapman comment above, almost. It’s like Izturis is in a constant state of being an average batter facing Chapman. Geez. I’m a little nervous. Get them tomorrow night guys. No really. Is this when I should stop myself from mentioning that if we pitched Chapman last night we might not have lost either one of these games? Wow. He’s trying to throw 106 in SD. Obvious over-throws on the last 2 pitches. Well, that was bad. Real bad. wow, our Reds fan still even Wow? – why not accept the FACT this team is fully collapsed with poor managment severely ill motivations and NO CHANGE lineups with Zack Cozart on field day by day, it’s over. stop dreaming Reds Fans. With Zack Cozart continues on field, there will be continually NO Win in post-season @ GABP. The day the Reds fire Dusty Idiotstick will be one of the finest days of my life. Every now and then you have to score a few runs to win a baseball game. Just saying. Sometimes 1 run won’t get it done. I was going to post right before Denorfia’s games winning HR that I did not feel real good about Cordero’s (tic) lack of recent pitching. Mix in the Reds extremely poor hitting and it all adds up to another loss. Men, the Reds are now 24-27 in their last 51 games. Playoff caliber – not really, sorry. It’s bad enough the reds lose, but I have to listen to Jim Day do the post game. Christ. This is what happens when you use your Sunday special lineup on Monday. The at bat to Alonso was the key. Alonso drew the walk (clogging the bases) and was on base for the home run. After the walk, Chapman grooved the first pitch to the next hitter. The Reds — except for Leake, Hoover and Robinson — were lousy tonight. This team is going nowhere if the offense continues in this pathetic state. Lack of hitting, clutch and otherwise, has cost us a chance to make up three games against the Cardinals while we, in the words of Thom Brennaman, have “scored a grand three runs.” And when Chapman is bad, he is bad. You just feel terrible for Leake and the others. feel terrible for Leake and the others? inlucding Zack Cozart??!! @0pswin@GABP: I meant the other pitchers who have suffered at the hands of this team’s lack of offense. Well Chapman looked sharp. What a waste of his talent. We need to trade him. I’m extremely upset and frustrated with this season. I know we are in a wild card spot, but this team is way too good for this. I think we can still put it together, but Dusty can’t seem to get out of his own way. @BearcatNation: Hey Bearcat, love the optimism even if its a little misplaced. @cincyreds14: This team has more talent than you give them credit for in my opinion. They just have put themselves in a position with an uphill battle. SOB, I was just falling alseep when Denorfia broke our hearts. That mixed feeling of anger and sadness that only baseball can provide would jolt anyone awake. Another day of exhaustion at work for me! That’s it. Life long fan and a die hard but enough is enough. Let this game mark the seal that solidifies this season as a loss. I’m tired of the apologists, I’m tired of the excuses, I’m tired of if RBIs matter or not, I’m tired of perplexing and ridiculous lineups, I’m tired of games like this where we lose due to pure lack of will or desire. Too many other teams have wanted it more, too many opponents have enforced their will upon the Reds, too many games lost where a victory was a near guarantee. Make excuses all you want. You can say its just one game but its much bigger than that. We have seen this script be enacted far too often this year. Game over, season over, and my desire to have hope and optimism for this team is over. Sad dark times in red land. @fiercev: Get some sleep my friend, I’ll see you tomorrow back here in the nation. I have grown weary of this team and this imbecile we have for a manager. Wake me when the moron has been escorted out of town. 2 x-reds to boot. At least we are not peaking too early. Mike Leake deserved better is all I can say. And Dusty obviously didn’t put a whole lot of importance on whether the Reds won the game or not, hence the lineup. Back at it tomorrow and see what kind of Dusty surprises awaits us. Go Reds! Adios Amigos. @Sergeant2: He wants to win, just has no clue how to. Of course, most of his position players aren’t helping the cause much. Dusty canÃ¢â‚¬â„¢t seem to get out of his own way. We have been begging for the Cards to go on a losing streak for months. And when they do, we respond by making a mess in our pants. This team needs something, anything to wake them up. Another WASTED pitching performance, absolutely pathetic. This is obviously on the offense, 3 runs in the last 43 innings is beyond horrible, we have no plate discipline and zero patience. Bunch of hackers. Also, this is on Baker, Chapman has thrown 1 inning in the last 10 days, NOT GOOD. TRADE HIM NOW! 4 losses in a row is bad, but its worse when the Cards have also lost 4 straight. Watching this game, I knew we’d lose 2-1, you could feel it. Wasted chances all game long. This team is not fun to watch. Paging Walt Jocketty!!!! We need RH Batting help ASAP. See if the Giants want Dusty back for Pence…. @abox03: Ha! Now that would be a dream trade, no matter how much we’d be paying HP. Chapman’s contribution over the last 10 days… 0.0 IP, 2 ER. Batters hitting 1.000/1.000/4.000. Heh. 5.000 OPS. WJ needs to grow a pair and tell Dusty he needs to start using him or he’ll trade him for anyone resembling a major league hitter. One day to go! Dusty going by his book again. Leake looked great, Hoover looked great – but oh no, we have to use our (rusty) closer. Dusty managing will simply destroy this team – count on it. Bad effort by the offense and bad effort by the closer – and in reality, quite predictable. @cincyreds14: The decision to use Chapman was the correct one. Gotta use him sometime to get the “rust” off. And we know he won’t be used in a non-save situation. It never ceases to amaze me that Chapman thinks he can consistently throw fastballs by people down the middle. 102 is very hittable when you are looking for it, as Chris Denorfia (can’t make this stuffup) can attest. Looking at LeCure’s stats (in WAY tougher situations, such as runners on base in tie games), he’s been superior to Chapman this year. Trade Chapman, let Sam close. @homerandbruce: We get it that you hate Dusty Baker. However, continually calling anyone an “idiot” or “imbecile” doesn’t reflect well. @kywhi: No matter how accurate. Reds pitching ERA over the 4 losses 2.13 (very good, if you take away the 3 runs scored in walk-off fashion its only 1.42, starting pitching). Fantastic. Opponent ERA in the 4 losses: 0.71 wow! Really hate to say it (especially since I posted it on this board a couple weeks ago) but this Red’s team is so much closer to a .500 team than a quality play-off team. Sad but true. Good night Red’s fans, maybe we will be cheering for a new manager tomorrow. When it comes to Dusty Baker I think Giants and Cubs fans are saying, welcome to the club.